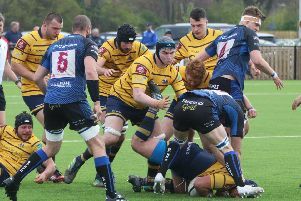 WORTHING Raiders Rugby Club got back to winning ways in the National 2 South with victory at Clifton on Saturday. Worthing slipped to a 28-24 home reverse against the division’s bottom side, Dings Crusaders, last time out but bounced back with a hard-fought away success. Raiders made a lively start and scored a try after only three minutes when Jamie Redmayne drove over from a line out and Matt McLean made no mistake with the conversion. Charles Foley got the home side’s first point of the game on 11 minutes when he converted a penalty to make it 7-3. Raiders responded with another try just three minutes after, though, as McLean scored after some slick interplay between the forwards and backs before successfully converting his try. Clifton then started to take control whilst Raiders lost some composure and discipline resulting in Clifton scoring three tries in final 20 minutes of the first half. On 19 minutes, the Clifton winger Lucas Slowik sprinted from the halfway line before passing to Rupert Freestone to score in the corner which James Mackay converted. Three minutes later, Lucas Slowik scored a try himself when he intercepted a pass and ran almost the full length of the pitch. Then, on 30 minutes, Benjamin Purcell drove over the Raiders line from a line out which Mackay successfully converted. Raiders were relieved to hear the half-time whistle so they could regroup. Straight from kick-off, Charlie McGowan drove over the line to put Raiders back in the ascendency. Clifton responded three minutes later when Lucas Slowik scored a second individual try. Raiders then took control of the game just like Clifton had at the end of the first half, scoring three tries in a 30-minute period. Alex Nielsen scored the first of his two tries after 49 minutes, receiving the ball after some excellent pressure from the forwards. Twenty minutes later, despite some resolute defence, Nielsen scored his second try from a maul after some more intense pressure on the Clifton line. Clifton spent the last five minutes of the game applying real pressure on Raiders and were rewarded on 79 minutes when Rupert Freestone scored in the corner with Mackay converting but it was too late as Raiders held out to bounce back with an away success. RAIDERS: Daniel Sargent, Elliott Luke, Matt Finney, David Yates, Charlie McGowan, Jamie Redmayne, Sam Hewick, Rob Smith, Calum Waters, Ben Dudley, Alex Nielson, Paul Burns, Kieren Leeming, Harry Forrest, Matt McLean. Subs: Charlie Piper, Josh Ibuanokpe, Iain Greenwood, Simon Gaynor, Scott Barlow.